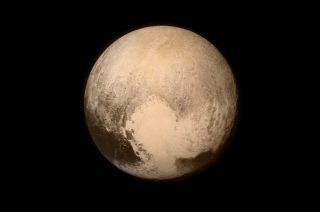 This famous photo showing Pluto's heart-shaped Tombaugh Regio was captured by NASA's New Horizons probe in July 2015. We hope you kept your head up this year, because there was a lot of spaceflight action in 2015. NASA spacecraft got up close and personal with two different dwarf planets, for example, and two private spaceflight companies pulled off rocket landings, suggesting that the long-sought dream of resuable launch vehicles could become a reality relatively soon. Pluto had remained largely mysterious since its 1930 discovery, because it's relatively small and orbits so far away (39 times farther from the sun than Earth does, on average). For instance, the best Pluto images taken by NASA's famous Hubble Space Telescope show the dwarf planet as but a blur of pixels. Furthermore, New Horizons' observations showed that a large ice plain on Pluto dubbed Sputnik Planum harbors no discernible craters, indicating that the area has been resurfaced in the very recent past. This came as a big surprise to mission scientists, who have since been trying to figure out how tiny, icy Pluto managed to stay geologically active 4.5 billion years after its birth. The flyby should end up teaching scientists a great deal not only about Pluto and its five moons, but also about other objects in the vast Kuiper Belt beyond Neptune's orbit, and the formation and evolution of the solar system as a whole, said mission principal investigator Alan Stern, of the Southwest Research Institute in Boulder, Colorado. Indeed, Stern thinks New Horizons will sit atop a number of other lists when all is said and done. "This is very special," Stern told Space.com shortly after the flyby. "I'm a biased guy on this, but I think this'll be the space event of the decade." New Horizons' work is far from done. The spacecraft will continue beaming home flyby data through next August or September, and it's currently making tracks for a small Kuiper Belt object called 2014 MU69 as well. The New Horizons team plans to fly by and study this object on Jan. 1, 2019, if NASA approves and funds a proposed extended mission. Spaceflight is an expensive proposition, in large part because rockets are used just once and then discarded. But two stunning reusable-rocket milestones toward the end of 2015 showed that a sea change may soon be coming to the field. On Nov. 23, the spaceflight company Blue Origin, which is led by Amazon.com founder Jeff Bezos, successfully landed its New Shepard rocket after a brief flight to suborbital space. Then, on Dec. 21, SpaceX brought the first stage of its Falcon 9 rocket back for a soft touchdown during a mission that lofted 11 satellites to Earth orbit. Such achievements show that fully and rapidly reusable rockets — which SpaceX founder and CEO Elon Musk has said could cut the cost of spaceflight by a factor of 100 or more, potentially making Mars colonization economically feasible — are far from a pipe dream. Pluto wasn't the only dwarf planet to get a close-up this year. In fact, it wasn't even the first one. Dawn's observations have brought Ceres into focus, and have revealed a number of strange and intriguing phenomena on the dwarf planet — including mysterious bright spots inside craters and a 3-mile-high (5 km) pyramid-shaped mountain whose slopes are streaked with whitish material. Dawn recently descended to its final and closest orbit, which takes the probe just 240 miles (385 km) from Ceres' heavily cratered surface. So the best may be yet to come from the well-traveled NASA probe. Astronauts who journey to Mars and back will spend more than a year traveling through space, and an ongoing experiment seeks to gauge just what this experience will do to their bodies and minds. This year witnessed one of the great spaceflight comeback stories in recent memory. Japan's Akatsuki probe was supposed to begin circling Venus on Dec. 6, 2010, but its main engine conked out during the crucial orbit-insertion burn, and the spacecraft went sailing off into deep space. Mission scientists didn't give up hope, however; they almost immediately began prepping for a second chance at the second planet from the sun. That chance finally came on Dec. 6 of this year — exactly five years after the first opportunity. Akatsuki succeeded this time, using its small attitude-control thrusters to enter Venus orbit. The probe is now studying the planet's weather, clouds and atmosphere, seeking clues about why and how Venus transitioned from a relatively hospitable planet billions of years ago to the scorching hothouse we know today. On June 28, SpaceX launched the seventh of at least 12 robotic cargo missions it is flying to the International Space Station for NASA under a $1.6 billion contract. The first six of these flights went perfectly, but the streak of success did not continue. Less than 3 minutes after lifting off from Cape Canaveral, SpaceX's Falcon 9 rocket exploded, leading to the destruction of the company's uncrewed Dragon capsule and all of its cargo. SpaceX traced the cause of the accident to a faulty steel strut in the rocket's upper stage. Elon Musk said that, going forward, the company would test every one of the hundreds of these struts that go into each Falcon 9. SpaceX also revamped the rocket, tweaking its stage-separation system and electronics, among other features. The new and improved Falcon 9 took flight less than 6 months after the accident, delivering 11 satellites to orbit for SpaceX customer Orbcomm on Dec. 21. During this launch, the rocket's first stage came back to Earth for a historic landing as well (see above). SpaceX wasn't the only spaceflight company to mount a return-to-flight mission this year. So did its competitor Orbital ATK, which initially received a $1.9 billion NASA contract to fly eight missions to the space station using a spacecraft called Cygnus and a rocket named Antares. NASA has since ordered two additional flights. Orbital's third contracted mission was lost in October 2014 when the Antares exploded just seconds after blasting off. The accident stemmed from a problem with one of the launcher's AJ-26 first-stage engines, and the company began developing a new version of Antares that swaps out the AJ-26s for RD-181 engines. The European Space Agency's Rosetta spacecraft made its historic arrival at a comet in August 2014, and a year later, the probe and its icy companion zipped around the sun. Rosetta and its host comet, known as 67P/Churyumov-Gerasimenko, made their closest approach to the sun on Aug. 12, coming within 116 million miles (186 million km) of our star. The "perihelion passage" was a highly anticipated phase of Rosetta's mission, because proximity to the sun's heat and radiation boosted 67P's activity, allowing scientists to learn more about the comet by studying the materials boiling off it. Rosetta, which also dropped a lander called Philae onto the comet's surface in November 2014, is now following 67P out into the depths of space. The spacecraft's mission will end in September 2016. In 2014, NASA tapped SpaceX and Boeing to build the commercial vessels that will ferry astronauts to and from the International Space Station. And this year, the agency chose the group of spaceflyers who will make the first trips on these private vehicles in 2017, if all goes according to plan. NASA announced in July that it had chosen Sunita Williams, Douglas Hurley, Robert Behnkem and Eric Boe to train on and fly the Dragon and CST-100 Starliner capsules, which are being built by SpaceX and Boeing, respectively. When these private spacecraft become operational, the United States will no longer be dependent on Russian Soyuz spacecraft to take its astronauts to and from orbit. This dependency — which costs NASA about $75 million per seat on the three-person Soyuz — has been in effect since the retirement of the space shuttle fleet in 2011. NASA's Curiosity rover celebrated an anniversary this past Aug. 5 — 3 years on Mars. Curiosity landed in August 2012 on a $2.5 billion mission to determine if Mars has ever been capable of hosting microbial life. The rover got answers very soon, finding that the area near its landing site inside Mars' Gale Crater harbored a potentially habitable lake and stream system billions of years ago. Curiosity's subsequent observations have helped scientists firm up and flesh out that picture. And in September 2014, the rover reached its chief science destination — the foothills of Mount Sharp, which rises 3 miles (5 km) into the Martian sky from Gale's center. Curiosity is currently climbing through these foothills, reading the rocks for clues about Mars' shift from a relatively warm and wet world to the cold and dry place it is today.